Learn some photo tips that can help you get some incredible underwater behavior photos on your next trip. 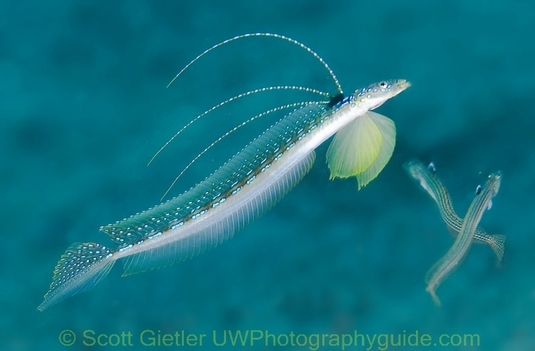 One of my favorite underwater past times is trying to photograph marine life behavior. In this article I show some examples of my favorite behavior photos, and some tips that I've learned over the years in getting these kinds of shots. Everyone has their own methods, so I hope you share some of yours too! 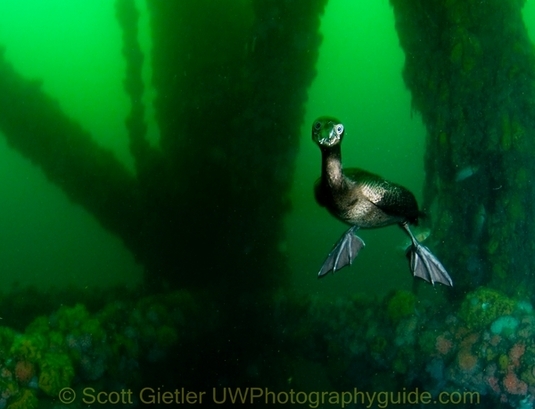 Very surprised cormorant, 80ft deep on an oil rig in Southern California. D300, Tokina 10-17mm. F8, 1/25th, ISO 250. Having my settings and focus ready for the unexpected helped with this shot. 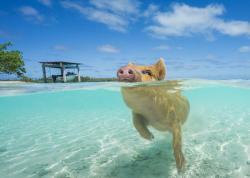 He was swimming down hunting for fish, when he was very surprised to notice me down there! That particular rig rarely had divers on it, I was on a trip to take some photographs for rockfish research and Milton Love's new book. 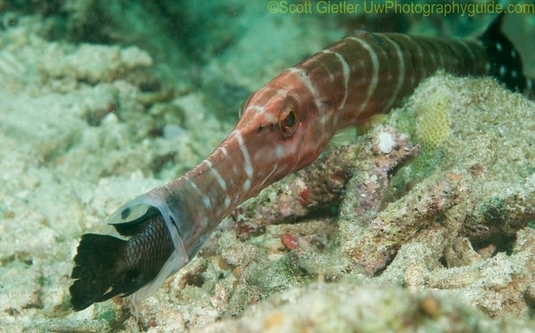 Trumpetfish having a treat on a reef in Anilao, Philippines. D300, 60mm lens. Paying attention to the dive guide, and carefully framing the shot were important. I was shocked when the other members of my group took one quick shot of this behavior, and then swam away. 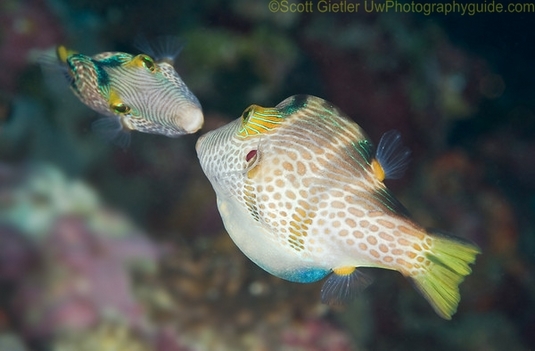 Sweetlips getting cleaned by two wrasse at the same time on the Liberty Wreck in Bali. Nikon D300, Tokina 10-17mm lens. F7, 1/320th, ISO 320. Becoming familiar with the dive site, patience, staying low, moving slowly, and controlling my breath all helped with this shot. 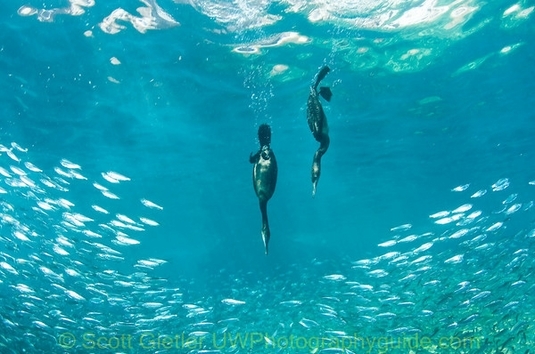 Cormorants chasing fish in La Paz, Baja. We often saw these cormorants hunting in groups, sometimes up to 5 birds. Chasing them around to get these shots was very tiring! Sandiver showing a mating display to 2 female members of his harem in the background. Taken in Amed, Bali. Nikon 105mm lens, F5.6, 1/160th, ISO 400. I was lucky I had my long lens on for this shot. 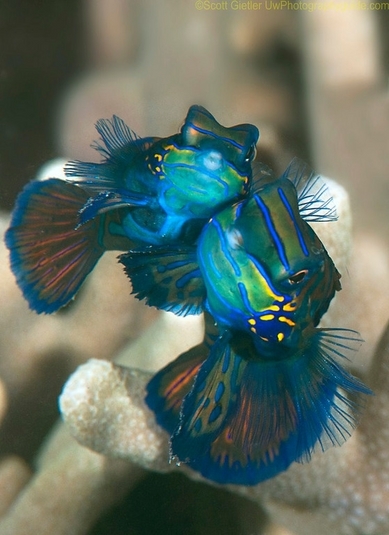 Mating mandarin fish, taken in Anilao. Nikon 105mm VR lens, Sola 600 photo light in red mode. F13, 1/250th, ISO 250. We spent about 55 minutes at dusk with these fish, I only saw a pair rise up to mate once (it lasted about 1.5 seconds) and only got one shot, luckily my 105mm lens focused correctly with the red light from my Sola shining on the fish. 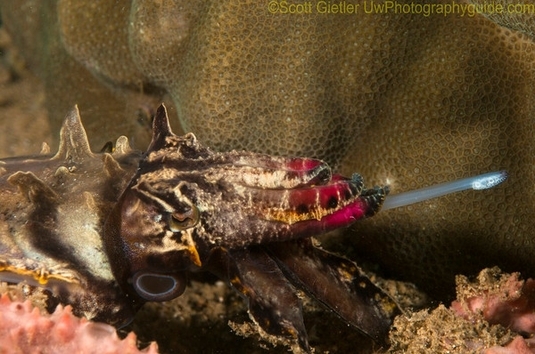 Flamboyant cuttlefish attempting to feed, taken in Anilao. Nikon 60mm + 1.4x tele. F11, 1/200th, ISO 250. We spend almost an hour with the subject, to photograph rare moments like this. Angel shark in the midst of taking off, after being surprised. Catalina island, Southern California. F9, 1/160th, ISO 400. 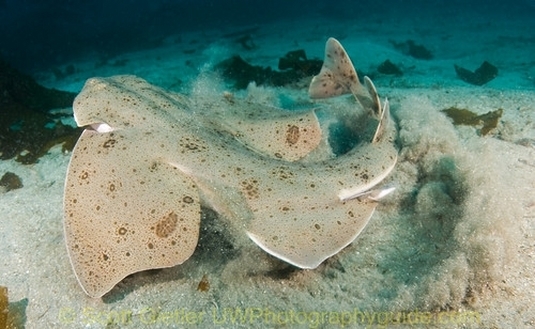 Angel sharks remain in stealth mode, and then take off very suddenly. After missing several shots like this, I started pre-visualizing this photo - so the next time I found an angel shark, I didn't miss the moment. Navanax striking a Hermissenda nudibranch. 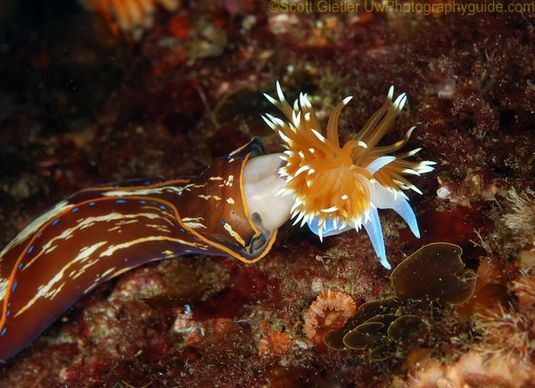 Half a second later, the nudibranch was gone. Taken at Catalina Island, Southern California. F10, 1/200th, ISO 160. Many shots have to be taken at just the precise moment, like this one, and the photos above and below. 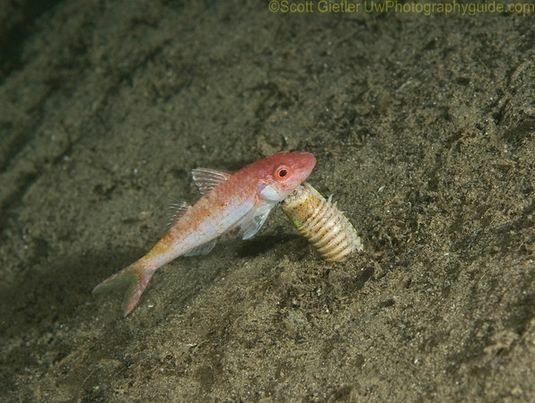 Bobbit worm eating a fish. One second later, the fish was completely pulled underground. Anilao, Philippines. Many thanks to our guide Peri for teaching us how to find & approach Bobbit worms. Tobies fighting for dominance. The tobies would be apart, but every minute would suddenly dart together for a second. 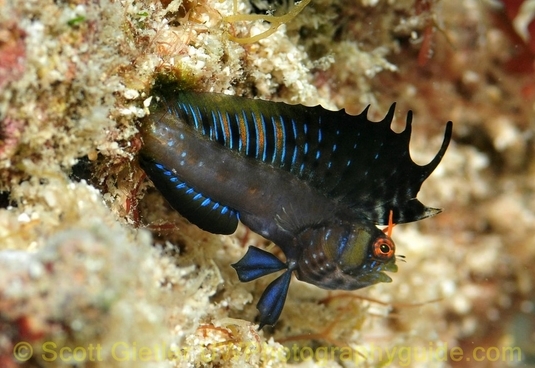 Signal blenny displaying his mating signal, by raising his dorsal fins. This behavior happened very quickly, and you had to be ready. Every 4-5 minutes he would jump out of his hole, flash his fins up for a second, and then go back in. After 20 minutes and a few failed attempts, I had a shot I was happy with. La Paz, Baja. Nikon 105mm VR lens. F11, 1/320th, ISO 200. Right before this trip, I was reviewing photo online from other photographers. Alex Mustard has just led a group there, and one of the group members Julian Cohen had a signal blenny shot. I emailed him to find out the dive site, and then spoke with our dive guides. Research can pay off! Sea lions biting my own fins, La Paz, Baja. Such playful guys! F7, 1/250th, ISO 320. 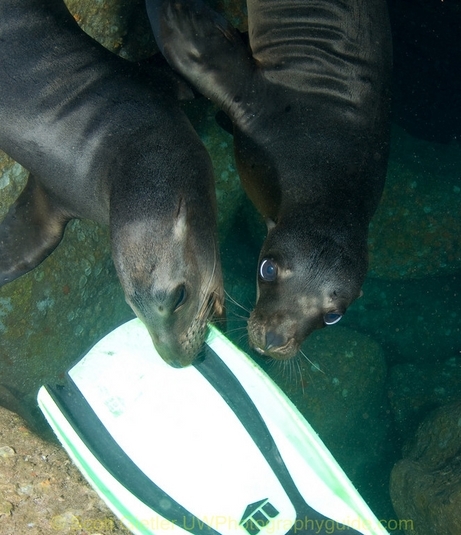 The sea lions at Los Islotes in La Paz are very playful (especially the pups), and when I felt a tug, I turned around to see these guys on my fins. 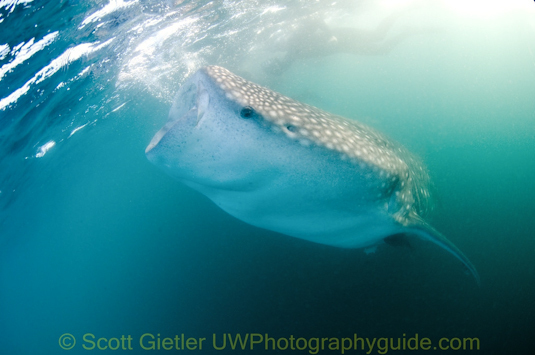 Whale shark taking in air and water, La Paz, Baja. F5, 1/160th, ISO 400. This shark feeds by actively sucking in large amounts of water, filtering out small bits of food with its gill rakers. The water exits through the gills. 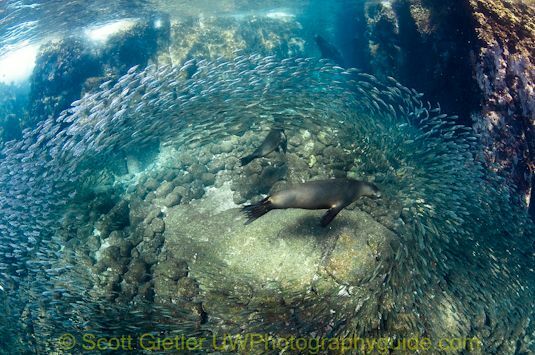 Sea lions chasing fish, dispersing the school around them, La Paz, Baja. F8, 1/200th, ISO 200. The fish normally school close together, and scenes like this only exist for a second. After seeing it happen once, we did several more dives at this site, just spending a lot of time hovering near the fish and sea lions waiting for something exciting to happen. Defining Behavior - what is behavior? 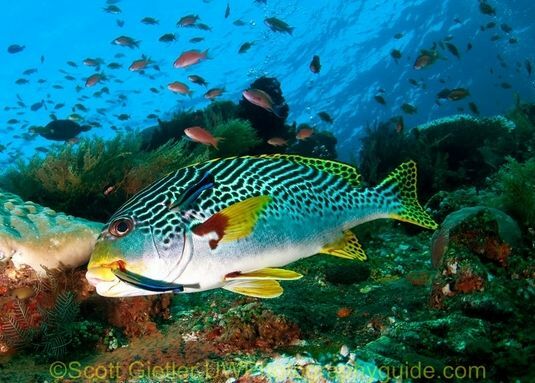 Almost anything underwater can be classified as behavior. Even swimming, or sitting still, to some are examples of behavior. Many old school photographers use the term "natural history" to refer to more passive behavior, such as laying eggs, brooding with eggs, guarding eggs, changing colors, symbiotic relationships, guarding a nest, throwing a lure, or sleeping. Other types of behavior are often classified under the "action" category like fast moving sharks or fish hunting other fish. What I consider a classic behavior shot are things like mating, fighting, cleaning, feeding, or showing emotion. Scenes that are a little unpredictable, a little hard to find or shoot. What do you consider a classic behavior photograph? Always be pre-focused to an optimal distance away, in case something suddenly shows up in front of you. Constant and consistent pre-focusing is important. Shoot in continuous focus mode, so the shutter can always be released. This is key - you may miss the shot if you camera has to focus when the shutter is pressed. Do long dives with a dive guide in small groups. Always let the dive guide know you want to shoot behavior. Research like crazy. Talk to guides and other divers about behavior they've seen. Get low, move slowly, and control your breathing if you are on open circuit scuba. Don't blow bubbles too close to your subject. Don't take your eye off the viewfinder or you will miss the shot. Use a red light for stealth with animals such as Bobbit worms and mandarin fish. Use a Sola 600 red light if you think bright light will disturb the marine life. If you witness good behavior that is repeated but hard to capture, repeat the dive several times if needed. If there is action going on, make sure you are using a fast shutter speed if there is ambient light in the photo (e.g. - a wide-angle shot). Up your ISO if needed. Use a long lens so you don't disturb behavior. 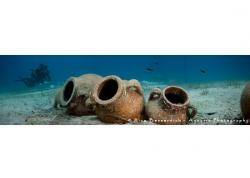 For shy marine life, you'll need a long lens like a 100mm or 105mm lens. If using a compact camera, zoom all the way in. Find an area of high-contrast and prefocus the lens so it does not have to hunt far. Composition-wise, fill the frame as much as possible, but don't amputate the subject.